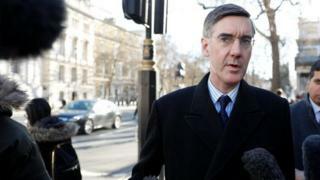 Claims the pro-Brexit ERG group of Tory MPs is "running the party from top to bottom" are "absolute nonsense", a Wales Office minister has said. Three Conservative MPs quit the party on Wednesday, accusing UK ministers of letting the "hard-line anti-EU awkward squad" take over the party. Minister Nigel Adams said European Research Group MPs would be "delighted" to think that but it was "comical". Other Tory MPs might also resign, but "I don't have a crystal ball", he said. Anna Soubry, Sarah Wollaston and Heidi Allen, who all support the campaign for another EU referendum, joined an independent group set up by former Labour MPs. Ms Soubry told a news conference: "The right wing, the hard-line anti-EU awkward squad that have destroyed every leader for the last 40 years are now running the Conservative Party from top to toe. They are the Conservative Party." On Tuesday, former Conservative Prime Minister Sir John Major said the party was being "manipulated" by Brexit "zealots" and the "mainstream majority" of MPs must reassert itself to stop a damaging EU exit. But Mr Adams told BBC Radio Wales: "I think if you spoke to any European Research Group member they would be delighted to think that they were running the party from top to bottom, that's absolute nonsense." Speaking on the Good Morning Wales programme he said: "The prime minister has had to deal with a very broad church, a very spread view of opinions on this particular issue. "The idea that somehow the ERG is running our party top to bottom is comical." "I think what she has to do is she has to be able to deliver a majority for her Withdrawal Agreement. "And let's not forget we have to deliver for the people of the United Kingdom [on the EU referendum result]. "So she has to bring people together, she's absolutely focused on bringing together compromises on both sides." Heidi Allen told ITV's Peston programme "a third" of Conservative MPs were fed up with the party's direction. Asked if there could be more defections from the party, Mr Adams, MP for the Yorkshire constituency of Selby and Ainsty, said "there might be". "One thing I don't have this morning is a crystal ball, there are strong opinions on all sides of this argument. "I'm absolutely determined that we leave on March the 29th."